This recipe comes to you from my second book, Comfort and Joy: Cooking for Two. While the cover features my famous (well, internet famous!) 15-minute puff pastry, it does in fact have 15 dessert for two recipes in the back. I just couldn’t resist sharing more small-batch sweets with you! You know how I am. 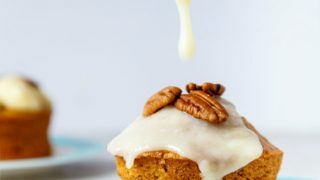 This warm carrot cake with melted cream cheese frosting almost didn’t enter into my life. One of my hobbies is barbecue. (Yes, a eating a certain kind of food can be a hobby!). I’ve eaten at many stops along the Texas barbecue trail, I’ve had all the famous places in Kansas City, and since my Dad grew up in North Carolina-you better believe I’ve slurped that mustard-sauced barbecue like a champ. Clear barbecue sauce? Yep! White barbecue sauce in Alabama? Yes ma’am! I love all forms of barbecue. I have serious harsh words for restaurants that do not make good barbecue. It’s not like I’ve gone on a twitter rant about it (I have), but it just irks me off. Barbecue is sacred. There is a method. One method. There are different meats, different sauces, and different woods, but low & slow & smoky is the same. I’m rambling. The point is, I ate at a very bad barbecue restaurant one time, but the warm carrot cake with melted cream cheese frosting on their dessert menu made up for it. In fact, the carrot cake kept me from a Yelp rant–it was that good. My husband loves carrot cake like no other cake. The middle layer of our wedding cake was carrot cake. He eats all the carrot cake flavored Lara bars. He asks me to make carrot cake when the Easter bunny is still in the bushes in the middle of winter. I make a lot of carrot cake. 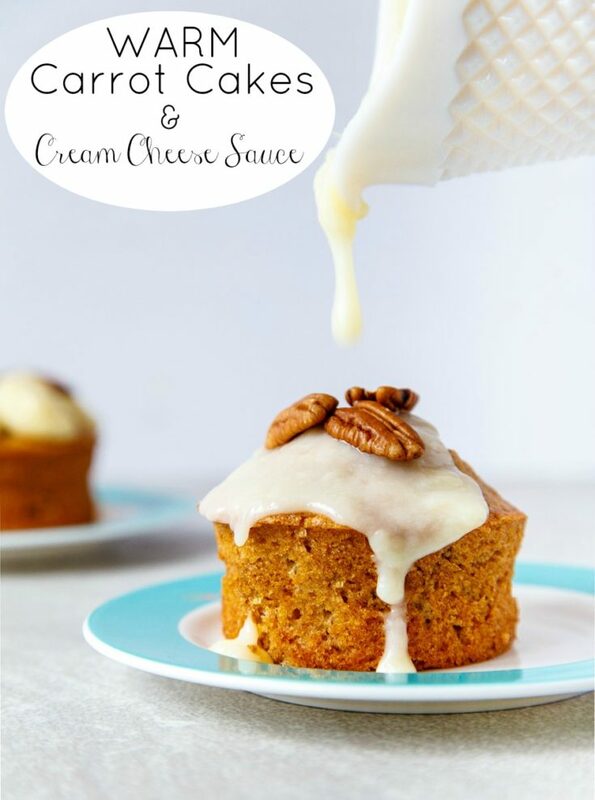 This warm mini carrot cake recipe is made in two tiny ramekins (the same size you use for creme brulee–6 ounces). Just to reiterate: this recipe makes TWO MINI CARROT CAKES IN TWO RAMEKINS. Then, make the warm cream cheese sauce the moment the cakes come out of the oven. A sprinkling of toasted pecans on top is, well, the icing on the cake. Preheat the oven to 350, and spray two 4-ounce ramekins very well with cooking spray. Place the ramekins on a small baking sheet. In a medium bowl, whisk together the oil, sugar, egg, vanilla, and grated carrots. Next, whisk together the remaining dry ingredients in a small bowl, and add to the wet ingredients. Stir until well-combined. Divide the mixture between the two ramekins; the batter should come almost up to the inner line. Bake on the baking sheet for 23-25 minutes, until nicely domed and a toothpick inserted comes out with only moist crumbs. In a small bowl, combine all of the sauce ingredients except for the vanilla, and microwave in 30-second pulses until melted. Whisk together, and stir in the vanilla. Pour over the cakes and serve. These are so adorable and perfect for celebrating the upcoming spring!! on that note, i need to go home and make carrot cake.. These look awesome! Love that they are mini :) thanks for sharing. Ohhh! There is a restaurant here in Nashville that makes does a warm carrot cake with chilled cream cheese icing. It is HEAVENLY! I cannot wait to make this!! I never about eating carrot cake warmed up but it sounds fabulous with the melted cream cheese icing. I love these little cakes! And ha ha about the cake stopping a yelp rant. These are adorable. I have been using brown sugar in place of granulated sugar lately and it’s going well. I am going to try that on this recipe too. I tried this receipe but the cake came out dry. I baked it for the 23minutes. What did i do wrong? I made these and they were very good, but did not come out very high and were kind of dense. Is there really suppose to be no baking powder or baking soda in them? If you get a chance to let me know, I would appreciate it. Hi Nancy! Someone added 1/4 teaspoon of baking soda and they were lighter & fluffier. Honestly, it’s been so long since I made this recipe that I can’t recall. I will make them again and report back.